Професор Иван Петров, директор на клиниката по неврология към МВР, който спаси живота ми! Удостоверение за годността на личното ми оръжие, боен пистолет "ВАЛТЕР-ППК" от 14.07.2006г. За многоуважаемия ми зет ПЛАМЕН - ФУТБОЛ ! Гледа се с VideoLANVLC media player. Може да се изтегли от тук. Метеорологични прогнози от спъника "Фобос"
I devote this website to my family, daughter Rositca, son Dimityr others and my friends and everybody who wish familiarize with my live and activities. So like there are none any former cops, thus there are not any former patriots, I wish everybody and my grandchild to see the things that happen in my live, activities, at the time we build up the fundamental of the Democratsy ! 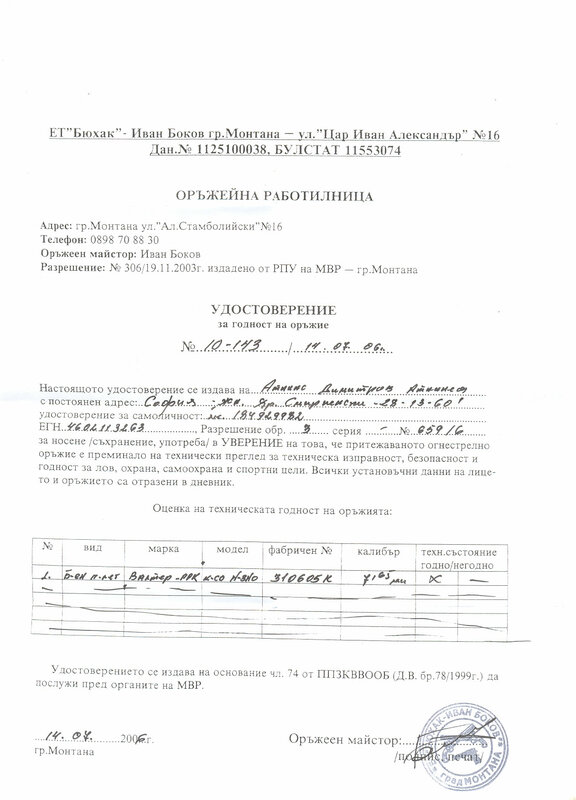 I served in MVR - „POLICE“ from 01.01.1965 to 08.05.1998 thirty-tree years, the best of which i devote to Protection of the public order and Safety of Republic Bulgaria and creation of the National police Sindikat in Bulgaria and the CESP membership, which guide Bulgaria to its membership in European union.